My freehand pencil drawings aren't as "good" as my computer drawings, but they have a lot more personality. In other news, I've fallen in love with Glori all over again. I'm going to have to start drawing her again. UPDATE: Wow, I guess I'm the only one in love with Glori. Keep going with her; I'm not in love yet, but I'm developing a minor crush. 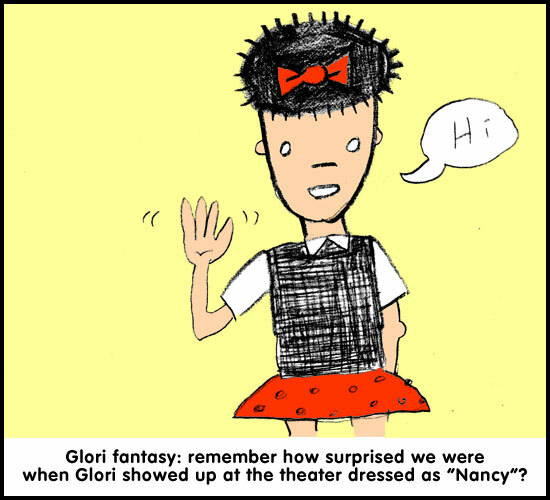 I think Glori is a delightful character and I want more! Haw, yeah, I know. I don't really expect people to respond to the really self-indulgent posts. On the other hand, if this was just another political blog, it would have died years ago (from my own boredom). Weird, incongruous features like this, Ugly Tour Bus Photoblogging, and Art Collection are what makes this blog different from so many others. We started a purely political blog three years ago, and we're not bored yet. But we love Glori, poor darling. 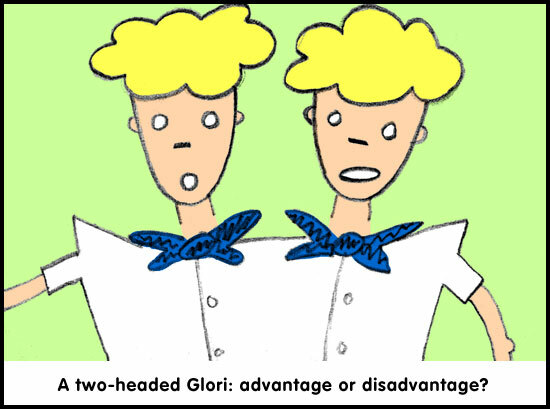 Because we've all known a Glori, haven't we? I haven't wanted to chime in on the Glori posts, but I do like seeing her as a character you draw. Oh, Diane, then you personally are in for a treat soon. Actually, I don't think of Glori as being any different from some of the other characters on this blog, like "Callista" or "Condoleezza Rice" or "Ursula Plassnik". All of them are fairly fictionalized and basically made into cartoon characters and feature in stories only tangentially related to reality. I see you as a great cartoonist, in a way. I've been wanting to say to you that you would do well with a strip, but in thinking about it, I perceive you as doing that already right here. Dear Petekins: You are not the only one in love with Glori, and please don't defend your sui generis genius blog. It's essentially perfection, a lot of work that looks simple and easy, which it is not. You do something which all art aspires to, which is make me look at the world a whole different way. OK, now you guys are embarrassing me. Diane, I've always been obsessed with daily comics, but learned very early that I had neither the skill nor the drive to do it. I'm simply not good enough (and that's not fishing for compliments; it's the truth). I like the Glori series. I'm fascinated by where its going.I do feel guilty chuckling at it becuase I feel like you're making fun of her. But now I'm begining to appreciate its an homage. Stick with it! I think that's why I never ended up doing anything with them originally, because it was almost too mean, and because Glori was the real name of a real person. But now it's 15 years later and, like I said, I looked and looked and made sure she had zero online presence. There is an undeniable "laughing and pointing" quality to them, and I probably wouldn't do something like this today. But we really did love Glori! And we went out of our way to be nice to her, for which she thanked us profusely. She really was a bizarre, tragic case. I do prefer hairdos and tour buses, but Glori is no more fictional than the Gingriches.